Home » What is Fire Alarm System? These alarms may be activated automatically from smoke detectors, and heat detectors or may also be activated via manual fire alarm activation devices such as manual call points or pull stations. Alarms can be either motorized bells or wall mountable sounders or horns. They can also be speaker strobes which sound an alarm, followed by a voice evacuation message which warns people inside the building not to use the elevators. Fire alarm sounders can be set to certain frequencies and different tones including low, medium and high, depending on the country and manufacturer of the device. Why use a Fire Alarm System? The effectiveness of the fire detection and alarm system depends on the stage of the fire at which it is operated. In order for all the occupants to escape without too much difficulty, an early alarm should operate before the escape routes becomes smoke-logged to such an extent as will cause occupants to have difficulty finding their way out of the building. 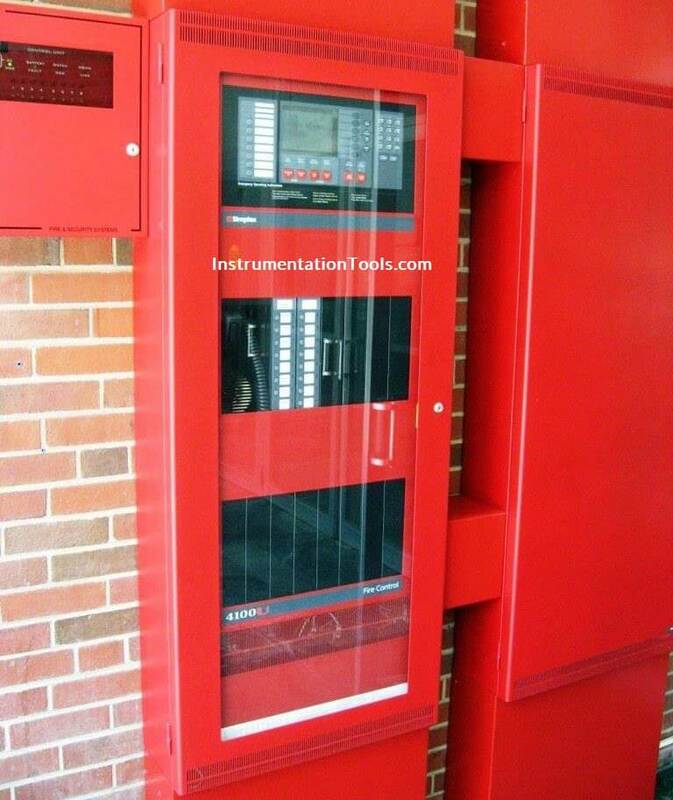 Fire Alarm Systems are used to protect life and property. Initiating devices are connected to the control panel by a 2- or 4-wire initiating device circuit. In the case of a power-limited system, 24VDC is applied to two wires going to a string of initiating devices, which are wired in parallel. Neither wire is grounded, and they are isolated from EMT or other raceways, which are grounded through the connector at the control panel. Polarity is also critical. This voltage is used to power the solid-state circuitry within each detector. It’s also used by the control panel to monitor the state (alarm or no alarm) of the initiating devices and zone wiring. 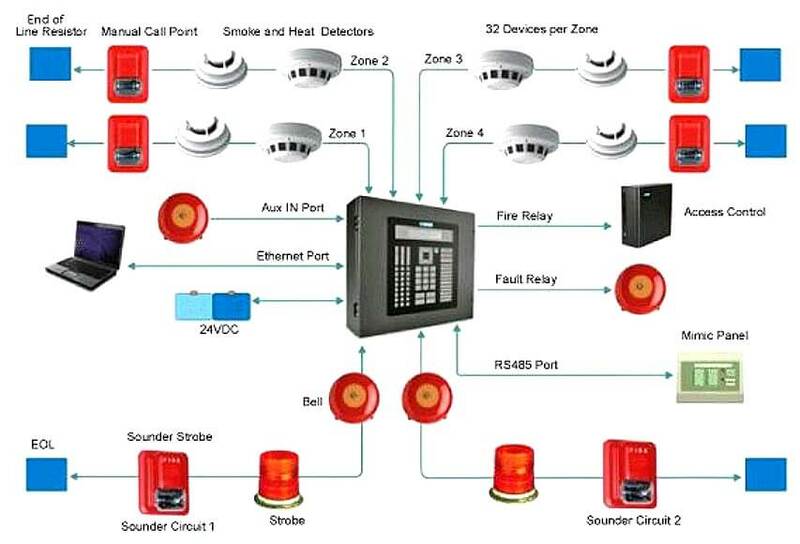 A typical fire alarm system has numerous initiating devices divided among separate zones – each connected via an initiating device circuit to a central control panel. The control panel performs supervisory functions over the initiating devices, indicating appliances, all associated field wiring, telephone ties, and its own internal wiring and circuit cards. How does a fire alarm system operate ? A fire alarm system operates in one of three (or more) states: normal, alarm, and trouble. The state is reported at all times on the alphanumeric display. If the system goes into alarm, the indicating appliances throughout the building go off. These could be very loud horns for some occupancies, or softer chimes in others, such as a nursing home. The control panel monitors the initiating device circuits at all times for shorts and open wiring by means of the applied DC voltage. The initiating devices are normally open. In the event of a fire they become conductive at close to zero ohms. How, then, is it possible for the control panel to differentiate between a non-alarm state and an open wiring fault? This is accomplished by means of an end-of-line resistor. Another capability of the fire alarm system is to call out in case of alarm. Two dedicated phone lines are connected, and the system performs test calls periodically in accordance with programmed instructions. If either phone line won’t connect, the system goes into the trouble state, so repairs can be made. The essence of a fire alarm system, as opposed to individual smoke detectors, even if they are wired to indicate in concert, is that it is supervised from a central location. The whole notion of supervision is critical. It does not mean that a person sits at the console and watches it at all times. What it means is that a supervisory voltage is applied to all circuitry, and current flow is monitored electronically to verify that equipment and wiring are intact. If the system goes into alarm and won’t silence due to touchpad malfunction, for example, it can be disarmed after the zone is checked for fire by cutting off the power. First, unhook one side of the battery array, then unhook the black-white-green incoming power connector. If a fire alarm system is disabled, maintenance and security personnel should initiate fire patrols throughout the building. The telephone monitoring agency should be informed, and the insurance company contacted to verify that coverage is not voided. What is the difference between a real and false alarm? None. All alarms are real and are caused by a break in the electrical current passing through the alarm system. Alarms can be sounded by someone activating a pull station, by something as simple as toast burning near a smoke detector, or by an actual fire. If an alarm sounds, something caused it. It might not be a fire, but don’t bet your life on it. All alarms should be treated as though they were caused by fire until it can be determined otherwise by a competent authority, such as the responding Fire Department. Over the years we have developed a dangerous complacency in response to fire alarms due to the overuse of the term “false alarm” to characterize an alarm not caused by actual fire. What should you do if I hear a fire alarm? Evacuate your building immediately and go to the area your supervisor has designated as a meeting point. For safety reasons, you should evacuate if you hear any alarm, even if it is not in your zone. Why do we need NFPA 72 compliance? NFPA 72 is a prescriptive standard that applies to Fire Alarm Systems. While the NFPA 72 standard makes no mention of gas detection, many clients are applying NFPA 72 standards and requirements to both fire and gas detection systems. When should we use a PLC vs. a Controller-based solution for F&G ? The choice between a PLC and Controller-based system is primarily driven by the size of the application. PLCs are best suited for medium to large size gas detection systems (25+ points of gas detection). For very large systems, PLCs have the advantage of scaling fairly inexpensively to accommodate large point counts. PLCs offer the added benefit of extensive connectivity options for communicating with other DCS or ESD systems. Controller-based gas detection lends itself to small to medium sized systems very effectively. A controller-based gas detection system is relatively easy to implement, and does not require software programming tools. The hardwired nature of a controller-based solution makes it inherently simple to troubleshoot and support. What is the difference between fail-safe operation and the supervision requirements of the fire codes and NFPA 72? The underlying principle of fail-safe design assumes that a process or item of equipment can be designed to take the process to a safe status on equipment failure or power interruption. This approach requires that the switch to “safe state” be possible without power and that the “normal operating state” of the equipment utilize energized control circuits. Almost all detection, extinguishing and notification circuits of a Fire Alarm system are not normally energized and are not “fail-safe”. In order to be sure these fire circuits are intact and ready for use when needed these circuits are “supervised”. Supervision is normally done using a small current or voltage passed through a field circuit device called an “end of line device”. This small current or voltage is continuously monitored to verify that the circuit is intact and ready for operation. Fire Alarm systems in many cases need to activate suppression or notification equipment in the event of a hazardous condition and these systems require power be available to do so. This is the primary arguments behind the NFPA 72 requirements associated with backup power systems and batteries. Should we take addressable fire alarm communications in to process areas? Addressable fire alarm communication devices can be used in process areas when the operating specifications of the devices are compatible with the electrical and environmental conditions found in these process areas. Most commercial addressable fire alarm equipment are normally rated for operation in general purpose environments with ambient temperatures between 0 and 50°C. Most process area environments have operating temperature ranges outside the 0-50°C range. Many process area environments require devices suitable for Division 1 or Division 2 areas. When using commercial addressable fire alarm equipment we normally recommend that the addressable equipment be located only in environmentally controlled areas such as crew quarters, control rooms, office areas. If devices to be connected to the addressable fire alarm system are to be located outside these environmentally controlled areas, we recommend the use of an addressable to conventional circuit converter to be installed inside the environmentally controlled area with a conventional circuit interface to the process area located device. What is Gas Leak Detection ?